With Ethereum’s launch in 2015 came a flurry of excitement over the future potential of smart contracts. Utilizing a more flexible scripting language than Bitcoin, the platform’s decentralized applications (DApps) were touted by proponents as unlocking a plethora of formerly untapped use cases for the blockchain. From tokenized assets and blockchain-based legal contracts to healthcare records and supply chain tracking, DApps are going to remold traditional industries in their image, solve bottlenecks and revolutionize enterprise inefficiencies out of existence. More than three years later, and we’re still waiting for the revolution. Taken in sum, Ethereum’s top 10 smart contract addresses account for just over 29 million transactions. Sounds substantial, as though the network is cracking on toward mainstream adoption, yeah? The reality: this transaction volume went to DApps that are used for token sales, decentralized exchanges and trading digital kittens. 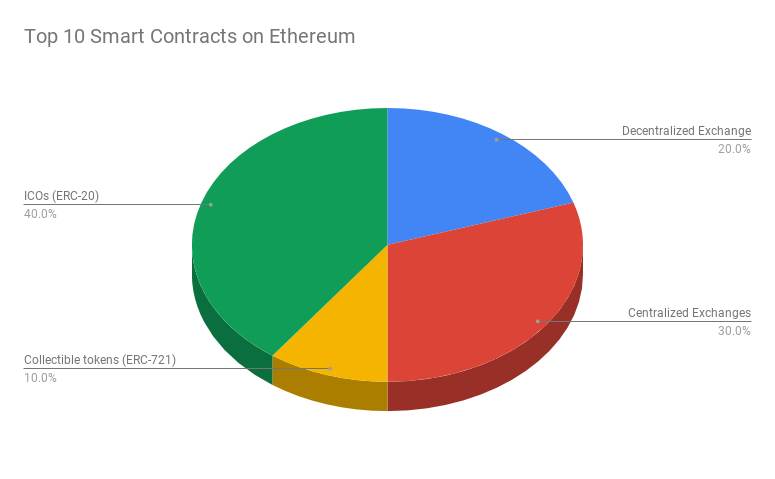 Using Jupyter Notebook to pull data from Google’s public dataset for Ethereum, the firm compiled a list of the most popular Ethereum smart contract addresses to see which DApps were gaining traction among the community. The results are in line with a common qualm amongst the community’s more discerning and critical voices, namely that DApps are used for little more than token speculation and exchange. Out of the 10 smart contracts that merited SFOX’s attention, only one was a tokenized use case that wasn’t either an exchange or an ICO contract. In fact, the two most popular DApps were decentralized exchange (DEX) contracts for Ether Delta (now known as Forked Delta) and IDEX, respectively. As this data shows, the two DEXs are go-to hubs to trade ether and ERC-20 tokens, the most common token standard for minting assets on the Ethereum blockchain. Ether Delta has accounted for 10,354,398 transactions since its inception, while IDEX clocks in at 4,590,376. In a show of irony, the third most popular smart contract was used to fund Ethereum’s leading competitor, EOS. Before launching its mainnet in June 2018, smart contract platform EOS held a continuous token sale, a year-long ICO that drew in billions in funding through 2,952,885 transactions. Two other Ethereum-based ICOs, Tron and OmiseGo, also made the list with 1,967,331 and 1,350,274 transactions, placing the cryptocurrency platforms at fifth and tenth, respectively. The only smart contract on the list that doesn’t involve speculating or supporting exchange infrastructure comes in the form of what some have called “digital Beanie Babies.” Depending on the angle you take, even these could be considered a vessel for investment. CryptoKitties, a blockchain-based game for trading, breeding and collecting digital cats, has seen 2,568,983 transactions since it launched last November. Built on the ERC-721 standard for non-fungible assets, each kitty is unique and sports its own distinct traits. The game grabbed headlines in the weeks following its release last year as enthusiasm for the pixilated felines drove prices for some of the rarer kitties to tens of thousands of dollars. This frenzied-demand clogged the Ethereum network, driving up transaction times and costs. The only other notable smart contract that made SFOX’s list comes from Bitcoinereum, the self-proclaimed “first bitcoin mineable ERC-20 token,” ringing up 1,451,763 transactions by paying out mining rewards through the token’s smart contract. As for the rest, Bittrex’s and Poloniex’s wallet reserves for managing and trading ether and tokens account for more than 5 million shared transactions. Of course, Ethereum DApps aren’t the only DApps in use today. EOS has emerged as a powerful rival, and, depending on the day, the platform surpasses Ethereum in transaction volume and users. Still, the use cases on EOS are the same. If they’re not being used for exchange, EOS tokens are used to power smart contract-enabled games or gambling, two gaming applications it shares with its number one competitor Ethereum. But the technology is still very much in its infancy, and the smart contracts being used today are a far cry from the ones that optimistic futurists say will underwrite loans, settle legal contracts and tokenize anything from equities to personal data. 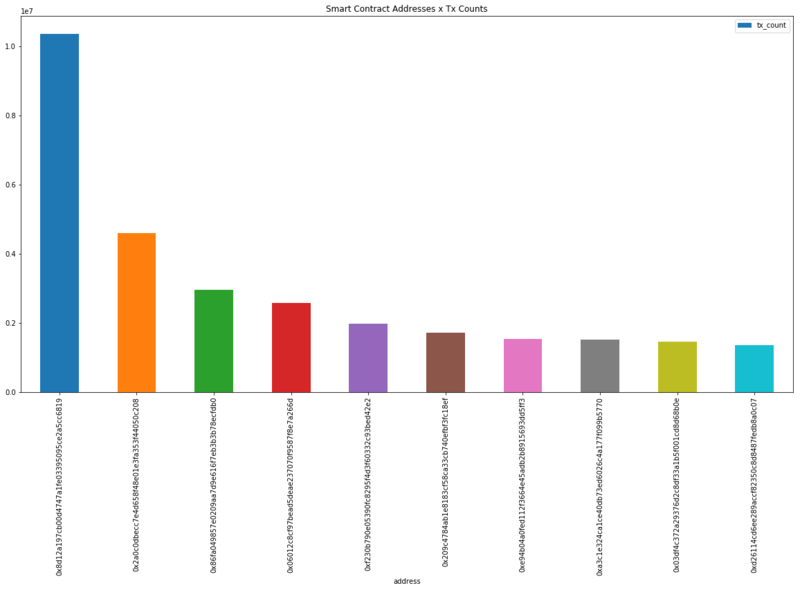 As Thobhani put it, “It’s hard to say anything especially conclusive about broader DApp adoption” from the sample size, even if it did represent the most-used DApps to date. These baby steps are the preliminary amblings of an ambitious technology that’s still learning to walk. But they are steps. Day to day, smart contracts and DApps are still functioning for their intended use cases, no matter how niche or inconsequential these uses may be. They’re laying a foundation for a future that may be a long time coming as the space grows up, as developers will have plenty of pain points to address, including smart contract security holes and scalability headaches, before smart contracts become consumer and enterprise grade for a mainstream audience. So until that future comes, token-curated craps shooting and packs of digital cats will have to do for now.